Critical Behavioral Competencies for IT Project Managers: What Are They? How Are They Learned? What behavioral competencies do experienced IT project managers apply when facing critical situations in their projects, and how have they developed those competencies? In this paper, the authors answer these questions. 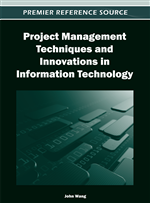 The authors interviewed 23 experienced IT project managers from 11 organizations, focusing on critical situations that they now managed differently from their earlier, novice, practices, and on how they had learned to develop these different approaches. The authors discuss a variety of management development and training interventions. They use a thematic analysis to identify the key competencies being applied and learning methods experienced by this set of managers. Results suggest that IT project managers are drawing on a different set of competencies from those required for project management in other industries. Additionally, this paper reveals the importance of informal learning channels, often involving project experiences, for the development of IT project management competencies. Information Technology (IT) projects have an unenviable reputation for poor performance, with well-publicized failures (Drummond, 1996; Lyytinen, Mathiassen, & Ropponen, 1998) and regular reports of major cost and schedule over-runs (Standish Group, 2001). There is, however, evidence that an experienced project manager, with the right project tools and methodology, can increase the likelihood of a successful project (Cooke-Davies, 2002; Sauer, Gemino, & Reich, 2007; Standish Group, 2001). Thus, there is increasing interest and emphasis within research and practice on the need to develop and manage the performance of IT project managers. While organizations make substantial investments in the development of their functional and line managers, through the provision of general management development initiatives including formal management and leadership training programs, performance appraisals, 360-degree feedback, and management coaching, less support is provided for development of project managers (El-Sabaa, 2001). Indeed, surveys of project managers reveal that few organizations provide specific project management training (Carbone & Gholston, 2004), with the result that project managers are often promoted to their positions based on the technical expertise they have demonstrated in prior projects (Matsuo, Wong, & Lai, 2008; Nellore & Balachandra, 2001) and must develop their project management skills through on-the-job experience (Matsuo et al., 2008) or by taking commercial training programs on their own initiative (El-Sabaa, 2001). The increasing move towards project-based work in organizations, coupled with the on-going problems in IT project performance, suggest that attention to the development of key knowledge, skills and abilities in project managers could be a fruitful avenue for organizations looking to improve their IT project performance. However, identifying the right focus for training and development efforts for IT project managers is critical if organizations are to get the project performance results they expect from their personnel developmental initiatives. In this study, we focus on identifying key behavioral competencies that experienced IT project managers apply in critical situations during their management of projects, and we explore the avenues by which these managers have developed these competencies in the course of their careers. By examining both the critical competencies that experienced managers are applying and how they have acquired these competencies, we are able to provide recommendations on effective development and training programs for the next generation of IT project managers. Two key objectives of this study were 1) to determine those competencies that are critical for IT project management; and 2) to identify avenues of learning these competencies that organizations can utilize for improved facilitation of training for less-experienced project managers.